Women and men alike are still engaged in their battle with unwanted hair using outdated weapons like razors and wax. Though these methods work, the result of shaving just doesn’t last long enough, while for waxing, for those who have tried it, knows how paiful it is. These methods may also lead to regrowth of hair in the wrong direction or cause unsightly bumps, lumps, and itching (especially for shaving_. Despite these, women who are skeptical about the use of laser still continue to follow their traditional regime for hair removal. WHAT DO YOU NEED TO KNOW ABOUT LASER HAIR REMOVAL in Bangkok? Using the latest laser technology available with SOPRANO ICE LASER by ALMA LASERS, the hair removal game in Bangkok has been revolutionized. Gone are the days when dark skin and light hairs are contraindicated. 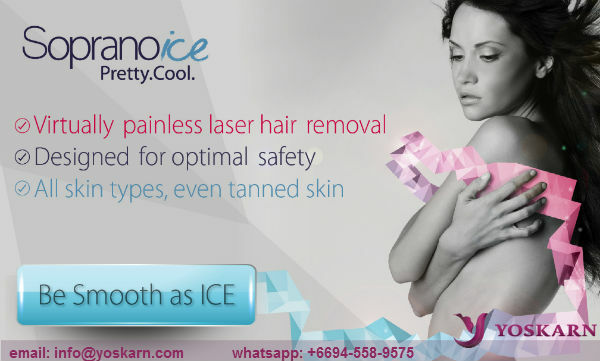 The technology in Soprano Ice Laser had made it possible to do laser hair removal at a lesser risk dark skinned patients, while simultaneously making the laser wavelength more effective for light colored hairs (whites and blondes). The versatility doesn't end there! Soprano Ice laser also uses a unique cooling system that allows virtually painless treatments even on delicate areas such as the armpit and bikini area. Laser hair removal can be done anywhere in the body but is more effective on dark hair. 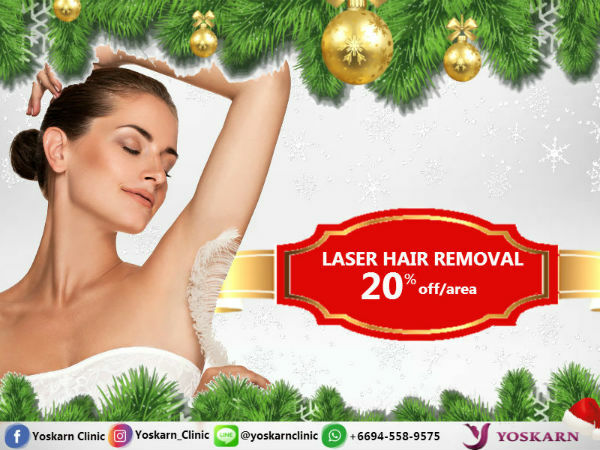 Some laser treatments may only be safe for those with light skin but at Yoskarn Clinic, several laser and light systems for hair removal are available hence we cater to all skin and hair colors. Our doctors and specialist will choose the type of laser or light that will suit individual hair characteristic and skin type of the patient. 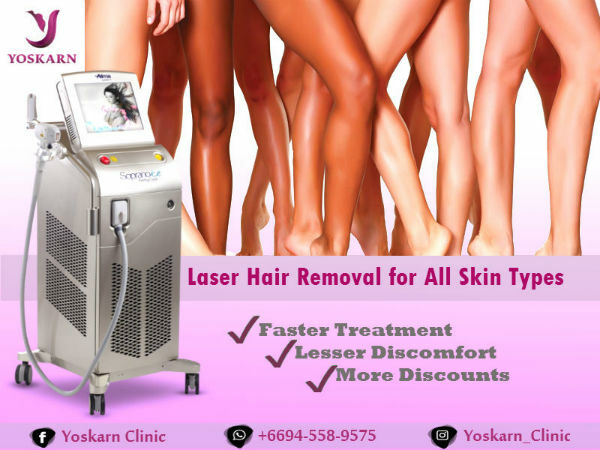 Some of the risks associated with laser hair removal in Bangkok are the possibility of scarring and burning, but with experienced medical professionals who will do the treatment for you using high quality machines available at Yoskarn Clinic, these risks are minimized if not totally eliminated. The result of this treatment is a permanent reduction of hair volume. As you do the treatment repetitively (5-7 sessions), hair growth on the area becomes slower and fewer and the hair becomes shorter that a touch up may be needed only once a year. HOW IS LASER HAIR REMOVAL in Bangkok DONE? Laser hair removal in Bangkok is done in an outpatient setting with the duration ranging from a few minutes to an hour depending on the area that will be treated. Several areas can be treated at once so there will be no problem. WHAT SHOULD YOU DO AFTER LASER HAIR REMOVAL in Bangkok? Patients who had done any laser treatment are encouraged to avoid sun exposure for at least 1 week after the treatment even if it's just laser hair removal. The use of sunscreen especially on the area that was treated is highly recommended even after this 1 week period. After laser hair removal, patients are also advised to just wash the area with mild soap and water, no scrubbing, and no scented soap. Since the growth cycle of hair varies, you may natice that hair growth is still the same after your first and 2nd treatment, but this does not mean laser hair removal is not working well, it is actually normal for hair to grow as they normally do after just 1 or 2 sessions of laser hair removal in Bangkok. Darkening and pigmentation is a possible effect of laser treatments but this rarely happens. Other patients don’t respond well to laser treatments so we cannot promise a perfect result but if you had an experience with laser treatment for the same concerns before, just please inform your dermatologist along with the result you’ve achieve so they will know which treatment to recommend for you. Women are still engaged in their battle with unwanted hair using outdated weapons like razors and wax.